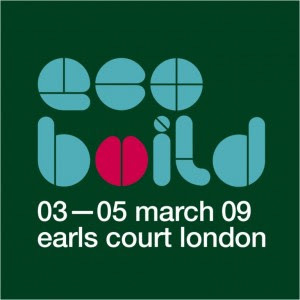 I have found very interesting to attend Ecobuild, not only because of its wide offer on what is commercially available sustainably speaking but especially because it is a broad and growing space if not in demand, at least in urgent need of designers. My point is not to praise the efficiency of a specific product, the qualities of such or such manufacturers, there is a plethora there. If you could regret the absence of more research-based exhibitors, what stroke me was the overwhelmed effect, the omnipresence of high-tech products, still lacking a sense of aesthetic, failing at engaging our emotions. The need for greater efficiency, more performant technologies makes no doubt in the quest for sustainability but is it the only stake? Why design & aesthetic should be absent of such a debate? Isn’t sustainability also about livability, -which means among many others, living in an environment that please our bodies and senses-? Interestingly, one of the Arena debate was shyly touching such a topic. Germaine Greer, Professor Emeritus of English Literature and Comparative Studies at the University of Warwick, Bill Dunster, Architect & Principal of the ZEDfactory, David Orr, Chief Executive of the National Housing Federation and Tony Juniper, Senior Associate, Cambridge University Program for Industry, UK Director, Friends of the Earth (2003-2008) were asked to debate about: Are Eco-Homes Ugly? Germaine Greer opened the debate with a provocative lampoon, in essence: “New Homes are universally ugly, and eco-houses are the most horrible of the lot! Not mincing her words, and sometimes omitting the complexity of designing green, her discourse had the merit to point out the role of design and designer in the apprehension of the Home, claiming that Eco-Homes are ugly because they copy real homes, […] because they are badly designed. Taking the example of photovoltaic technologies, she questioned why we should apply photovoltaic panels on the top of the roof as an incongruous decoration, they should be the roof, the whole house should be photovoltaic, indirectly tackling the necessity to develop an aesthetic from these new green technologies! Bill Dunster emphasized that the presupposed ugliness of Eco-Homes had nothing to deal with their green face, but rather with the responsibility of the designer & the quality of the design itself, offering examples of successful eco-home design such as BedZed. He also pointed out that the issue is certainly more about converting current housing into eco-home rather than designing new eco-building, 80% of the UK housing park being constituted of old buildings. David Orr rather insisted on what a good, a beautiful design means, suggesting that the notion of livability is crucial in the apprehension of a place where we would like to stay. So to speak, Ecobuild was a great experience to test the temperature of the Eco-Home market, comforting myself in the necessity to question how new technologies can enhance sustainability.